A narrative essay is a form of creative writing that presents a story, typically from the point-of-view of the writer. Narration essays are also known as "personal essays" because they often describe an event or series of events in the life of an individual. Those unfamiliar with narrative essay form may mistake it for a short story, since it's a brief text that tells a story. However, learners should be clear on the difference between the two genres: a short story is a form of fiction, meaning it's made up. Narrative essays, on the other hand, should almost always reflect the true events of a person's life. Despite their differences, however, they do employ many of the same writing conventions. Both are creative forms of writing, and thus require the writer to engage readers both aesthetically and emotionally. To do this, the writer has to compel the reader to keep reading by making the text engaging. One of the most important things to remember when composing narrative essays is to use vivid, descriptive language. Descriptive language consists of words and phrases that produce images in the mind of the reader. Just as reading a short story is boring unless the reader can picture the setting and the characters and understand the way the characters feel, a narrative essay is boring unless the reader can truly "see" the events taking place and feel why they're significant. Descriptive language includes adjectives and adverbs (describing words), but also figurative language. Figurative language is language that creates images through comparisons or suggestions, such as metaphors and similes. Figurative language can be very effective in portraying people, scenes, and events. Consider the difference between the following two descriptions: "Laura's hair was long and brown" and "Laura's hair was like a horse's mane." Notice how the second description, which uses a simile (the hair was like a mane), evokes an image in the mind's eye, whereas the first merely provides information. In addition to descriptive language, all narrative essays must have conflict. 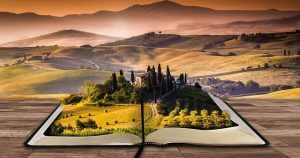 Just as a short story wouldn't be interesting if there were no conflict, narration falls flat unless the reader feels as though what is being told is an important event in the life of the writer. This doesn't mean that the writing must be related to a momentous life event, such as a death or a birth. There can be conflict in small things, such as the first day of school, a fight with a friend, or a drive through the park. Conflict can be internal as well as external, and small events can evoke this conflict just as easily as large ones. Finally, be genuine. Students should pick a subject that truly matters to them and reflect on it honestly and candidly. The best narration essays are those in which the real mind and personality of the writer are evident throughout the entirety of the text. When completing a narrative essay, your primary objective is to tell a story to the reader. This may be accomplished by exploring the author's values or by the author reflecting on a specific memory, thought, or event. As such, the writer may discuss something that happened in the his/her past or present and may be about a variety of topics, including recollecting a memorable event or person. As you complete a narrative essay, you'll need to try to loosen up a bit more than when you complete an academic paper. Your words should make the reader feel as if he/she is listening to the real you as you speak in the same way you would when having a casual conversation. Therefore, you should "talk" in the first person, which means using the words "I," "my," and "myself." Some writers find it helpful to actually tape themselves telling the story that they want to share. This way, you can get a better idea of how you naturally speak and you can essentially transcribe your story into writing for your document. From here, you can make the necessary changes to make sure it flows properly and is grammatically correct. If you're assigned a narrative essay and don't have a personal life experience that suits the required topic, you may choose to write about someone else instead. Another option is to narrate observations that you have made about a recent event. For example, you might engage in narration about your parents, children, or favorite hobby. In addition to telling a story, a narration essay typically involves making a point in some manner. This point may be to express an opinion, to help the reader understand something better, or to simply give the reader something to reflect upon. As with any type of academic paper, narrative reports should have an introduction that clearly expresses the type of narration that you'll be providing. For example, you might be writing about a personal experience, about a special event, about a recurring activity, or about an observation. Somewhere within the narrative essay, you should also include at least one anecdote. In addition, you should describe the event, person, or scene that you're writing about in great detail. You can also feel free to include dialogue, just be certain it's punctuated correctly and that it's not overused. Keep in mind that you wan the reader to reflect upon the human experience after reading your document. Therefore, you don't want to bog it down with dialogue or with cliches. When completing your conclusion, you should strive to make some sort of point. The conclusion should serve to help the reader make the connections the paper is trying to create while also leaving the reader with a lasting thought or impression. It was a bloody mess. As I looked down at my hands in anguish I realized that it was not just my appendages that were bloody, but the entire front of my shirt was streaked amber red and the tops of my jeans were much darker as well. A looked down at the body of a young girl, it was blackened with mud, and smelled like gasoline and burnt rubber. Of course, that could have been the environment and not her, but I was too anxious to tell the difference. • A Western girl who has been home-schooled and lived on a ranch visits her grandparents in the New Jersey suburbs for the first time. I recognized this fact early so my images of the British Isles were limited to my grandparents' recollections and what I was able to read. Neither totally satisfied my interest but it was all I had and I never missed a chance to learn more and I became content with the idea that I would likely never have the opportunity to visit England.